Pledging that Honolulu must also recycle more and seek better trash-reducing technology, the City Council decided yesterday to expand Waimanalo Gulch Landfill on the Leeward Coast. The Council's 6-3 vote came after a year of study by a citizen panel, 11 public hearings before a Council committee and two last-minute sites -- in an industrial park and a volcanic crater -- that didn't fly. In the end, the apparent path of least resistance was to keep the current landfill open past its current May 2008 closing date. Waianae Coast residents who opposed the site complained that the Council's action violated earlier promises to close the landfill that were made by Mayor Jeremy Harris' administration. Yesterday was the Council's deadline for naming the city's next landfill under a state Land Use Commission order. Other finalist sites were Maili, Nanakuli and Makaiwa Gulch, all on the Leeward Coast, and Kapaa Quarry in Kailua. A 23-acre Campbell Industrial Park site proposed on Nov. 19 turned out to have a deed prohibition against use as a landfill. » The site has more than 15 years of capacity. » The city owns it and landfill infrastructure is in place, so it is the least expensive choice. » Other sites would cost the city millions to buy land. » It is the closest of five contender sites to the city's HPOWER waste-to-energy plant. » Landowners of several other sites had promised to resist a city purchase, forcing condemnation proceedings. » Waimanalo Gulch is the only site with known operating costs. » Any other landfill site would face the same odor and trash-control problems. Tam added that an extension of Waimanalo Gulch might not be needed if the city can reduce its trash volume with more recycling and technology. No other sites were voted on at yesterday's meeting. Most members emphasized the urgent need to reduce the flow of trash to the landfill. "Waimanalo Gulch is the only one that makes sense at this point," Councilman Gary Okino said, and is "cheapest by far." He noted that the landfill is farther from the nearest homes than proposed sites in Nanakuli and Maili. "A lot more mitigation can be done" at Waimanalo Gulch to reduce the odor and blowing litter that nearby residents complain about, Okino said. About 20 people gave testimony at the meeting. Most opposed a landfill on the Leeward Coast. Some spoke in favor of shipping garbage to the mainland. "I'm disappointed that public officials have broken their word," state Sen. Colleen Hanabusa (D, Waianae) said after the vote. "When is a promise worth anything?" "It's unfortunate that the Council chose Waimanalo Gulch, but I and others will continue to fight to ship our trash out," Councilman Mike Gabbard said after the meeting, which was his last in office. 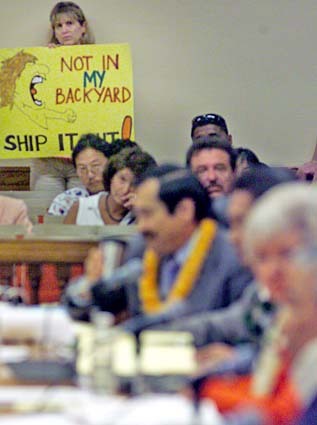 "I want Waimanalo Gulch to close by May 1, 2008, as was originally promised to the people of the Waianae Coast." Mayor Jeremy Harris commented after the vote that reducing Oahu's trash volume enough to need a landfill only for emergencies is simple: Recycle more; expand HPOWER's capacity to make electricity from what cannot be recycled; use HPOWER ash in asphalt; and use Waimanalo Gulch for backup. Harris called some Council members' assertions that a new technology is the solution "wishful thinking." "It would be nice if there was some mystical technology where you pushed a button and it all goes away, but there is no such technology," he said. State Sierra Club Director Jeff Mikulina said, "The soul searching that accompanied the landfill selection decision need not be in vain." Curbside recycling and the state bottle bill will help reduce waste going to the landfill, but more can be done, he said, and the solution could be as much in people's behavior as some yet-unfound technology.